Its Diwali. The eve before Hindu New Year - Vikram Samvat - Starts. Today marks the last day of Vikram Samvat 2068 and tomorrow shall be the first day of Vikram Samvat 2069. With the coming of new year, we all sincerely hope and pray that life, both professionally and personally, begin on a good note. The day was very nice, as all Diwali days are. Most of us, as the tradition goes, wore new clothes and greeted each other. The decorations are there and so are the colorful rangolis - atleast 2 are made every day till day after tomorrow. The mood has been, despite the fact that we are working on a holiday, vibrant. For those who dont understand, Working in Diwali is equivalent of working during the Christmas Week, Anyways, work dynamics are something which will never change. I had burnt and edited a DVD for my boss for the events that happened on a saturday. My boss liked it but suggested some cosmetic changes, which i hope, will happen by Thursday. I will call it a day soon. Tomorrow, i will wake up early, as i usually do on Wednesdays. I will visit the temple and seek blessings. And i will start the new year with a mission. This is something which very very few, maybe just 4 or 5 people know about. Hopefully the mission that i will undertake tomorrow will be a successful one and will be the best start anyone can have for a new year. 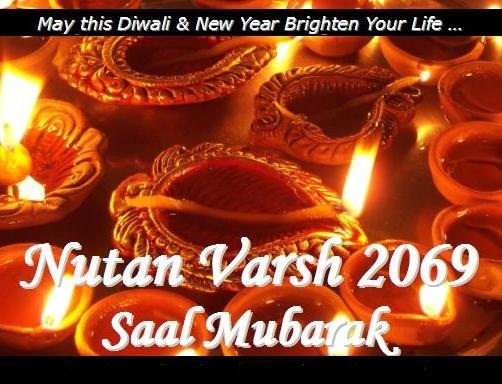 So i will take leave, and i wish all of you who are reading this blog, and your family, friends, near and dear ones, and even people who may not like me, a very happy Diwali and best wishes for a successful and prosperous Vikram Samvat 2069.